I was in Moscow last week on business and, in a little bit of spare time, had a good old wander around Red Square and the Kremlin. Although I’ve been in Russia a few times in the past few years, I hadn’t actually revisited the square since the first time I was there in 1987. Now, it’s probably my age but, being a child of the Cold War era, images of Soviet-era parades and old movies with fur-hatted men furtively passing secrets in the snow under the Kremlin towers were filling my mind so, as night follows day, I suddenly had the urge to read some John le Carré. The magic of the Kindle worked and that evening after dinner, I was tucked up in my hotel bed with The Honourable Schoolboy. It probably wasn’t the obvious choice as it focuses on events in South East Asia, rather than Cold War Europe. It was, however, the next on my le Carré list to read (or, actually, re-read) following my review last year of Tinker, Tailor, Soldier, Spy which is itself in the public consciousness again with the release of the new movie version. Following the unmasking of the mole at the heart of the Circus, le Carré’s fictional British Secret Service, George Smiley has been put at its head to determine the extent of its penetration and to salvage what he can from the rubble. As well as being demoralised and financially crippled, the Whitehall bureaucrats and politicians are circling, waiting to sntach chunks to add to their own empires. Smiley’s personal life is also in tatters with his wife, the beautiful but sexually incontinent Ann, having been outed as the traitor’s lover and having again deserted George. He is also becoming slightly obsessed with Karla, his nemesis from Moscow Centre, the spymaster behind the infiltration of the Circus. 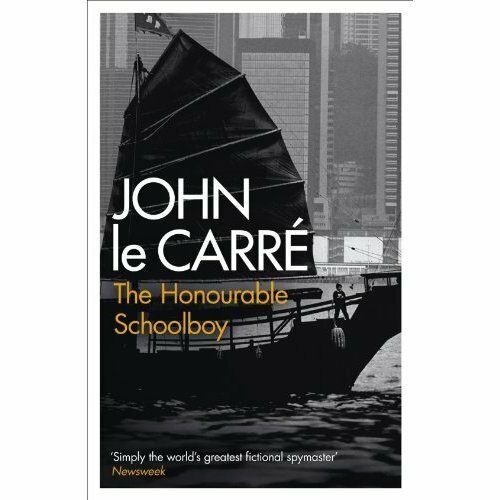 Many of the characters from Tinker, Tailor also appear in The Honourable Schoolboy. Smiley is still faithfully protected by his strange little bodyguard, Fawn and Peter Guillam remains as his cup-bearer. The eccentric analyst Connie Sachs is present and Oliver Lacon is joined by a number of other, even more reptilian, civil servants. The Circus is under intense pressure to achieve something to justify its continued existence. Smiley and Connie embark on a strategy of “taking back-bearings” – by reviewing old cases that had been suppressed by the mole on Karla’s orders, they can ascertain what Moscow is concerned about and then come up with an offensive operation. Whilst doing this, they uncover a money-laundering operation in South East Asia pursuant to which Karla is funnelling cash to a Soviet agent. At this point, the Honourable Jerry Westerby, a journalist and part-time Circus spy (and the titular character of the book) is called out of his Italian retirement to help Smiley investigate the identity of the beneficiary of the funds. Smiley then uses him as a tool to shake up the other side in order to bring the Soviet spy into the open. Jerry is a conflicted kind of guy, however, and for both him and Smiley, their personal issues begin to interfere more and more with their professional roles with some depressingly inevitable conclusions as what should be a triumph for the Circus brings defeat for them both. 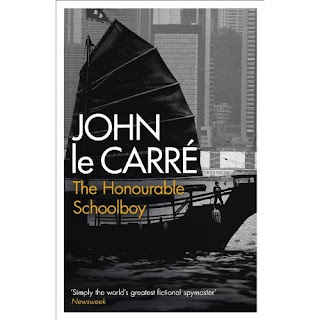 The Honourable Schoolboy was written in the mid-1970s during the tragic dénouement of US involvement in South East Asia and at a time of financial woe in the UK (plus ça change…..) and, just as a period piece, it is full of the flavour of that time – the decaying corruption and sweaty grime of the drug-addled wars in places such as Laos and Cambodia, the long, slow decline of British colonial rule in Hong Kong and the tired and tawdry stagnation of London. In the sections of the book set in Hong Kong, there are even foreshadowings of the shift in financial power from East to West that we are experiencing today as the British taipans are portrayed as corrupt, lazy and morally bankrupt and ripe by contrast to the new energetic and confident Chinese businessmen. Beneath the historical canvas, there is a downbeat air of deception of betrayal throughout the book on numerous levels. Smiley’s pre-occupation with Karla seemingly blinds him to the plotting of Enderby and the CIA liaison Martello which ultimately results in his downfall. There are numerous personal betrayals – Smiley by Ann and the Orphan by Westerby to name just two. And, of course, there are the professional betrayals that we expect in a spy novel. Noone is clean in this book and at every turn, there is cheating, deception and dishonesty. If I’m being honest, the book could have been a couple of hundred pages shorter as le Carré got a little carried away with his Asian war zone descriptions. Also, the period Hong Kong expat language seems very old-fashioned and a bit camp. It is also not a book to be read when you’re down as it is very bleak and pessimistic in its world view. It is, however, satisfyingly complex and meaty as well as giving a plausibly grubby view of the secret world and, save for some of the dialogue, stands up well to the passage of time. Was in Moscow last year, it was the end of my Trans-Siberian rail adventure :) I read The Sky Who Came in From the Cold and The Constant Gardner and in both instances felt le Carre lacked a bit of emotional punch. He writes about powerful stuff, but in a detached (almost "journalistic") way. Very jealous of your Trans-Siberian adventure. It is one of the things Mrs F and I are going to do when we retire and mini-Falaise is safely off at university. I know what you mean about the detached way he writes but I see this as showing the ambiguous way the secret world operates and the conflicting feelings spies have. The Constant Gardener is one of those few books where I preferred the movie. Claim free bitcoins from CLAIM BTC Faucet. 21 to 57 satoshis every 20 minutes. If you are searching for the #1 bitcoin exchanger, then you should know YoBit. With voice, SMS & data plans always start at £0.00/month (100% FREE). If you are trying to BUY bitcoins online, PAXFUL is the best source for bitcoins as it allows buying bitcoins by 100's of different payment methods, such as MoneyGram, Western Union, PayPal, Credit Cards and even converting your gift cards for bitcoins. Did you ever try to maximize your free bitcoin collections with a BITCOIN FAUCET ROTATOR?